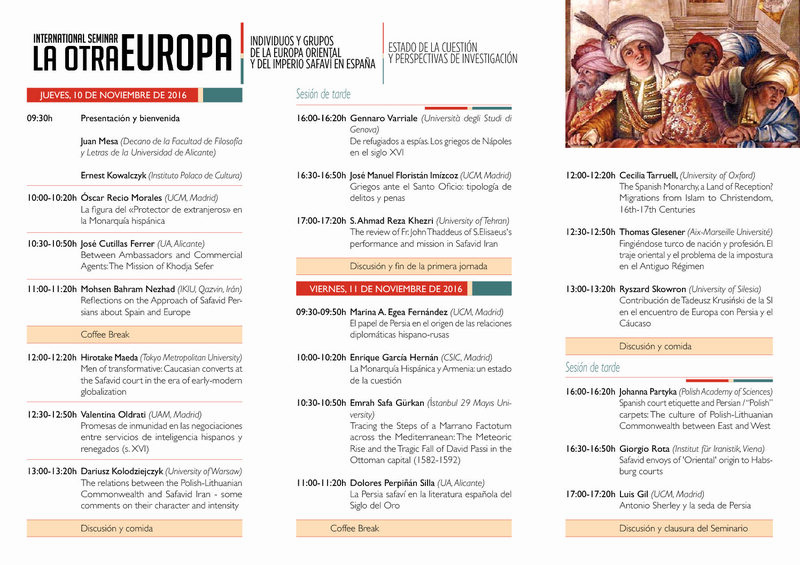 uroest (The Other Europe: Eastern Europeans and Safavid Communities in Spain and Its Wider World) and the Generalitat Valenciana sponsored the session held at the University of Alicante, Spain (10-11 November 2016) with the financial support of the Soudaar Memorial Foundation. The International Seminar highlights new approaches and methods for the study of Eastern Europeans and Safavid Communities in Spain, Portugal, and its Wider World. The concepts of “Eastern” foreigners and the Spanish Monarchy should be interpreted broadly, as foreigners, particularly the Eastern foreigners, not only changed from nationalities to another, but also crossed political, cultural, and social borders to inserted into a new framework.